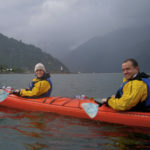 We met late in a trip that had already taken my husband Jordan and I deep into the Chilean Patagonia. Journeying to the ends of the earth we rode sturdy criollos alongside spindly guanaco herds, hunted fossils of giant sloths, felt the grumbles and groans of crumbling glaciers before flying north. Waking in Patagonia and ending your day in Atacama Desert is truly like traveling to Mars – although separated by only a few hours in a plane, the landscapes are completely opposite. Arriving content but weary, I found myself wrestling with the dry altitude (the Spanish-colonial pueblo of San Pedro de Atacama rests at 7,900 feet above sea level). Jordan, however, had his mind set on one thing: summiting one of the majestic volcanoes lumbering in our horizon. We chose Cerro Toco, elevation 18,386 feet. You don’t just decide you want to walk up one of these bad boys in the morning and do it that afternoon. It takes deliberate acclimatization. After spending a couple days doing lighter hikes around eight and nine thousand feet, eating healthfully, and restraining ourselves from too much velvety Chilean red, we set off with our guide Carolina for a little known salt lake sitting at 14,000 ft about 3 hours south of town. The van dropped us off in what felt like the middle of nowhere, a fierce alpine wind making us thankful to be dressed for a Minnesota winter; rain pants over hiking pants over long underwear, fleeces, down jackets, yet another wind layer, a brimmed cap for sun and then a wool hat for warmth. I couldn’t help but look around at the desolate miles stretching before us of golden grass nibbled down to its roots by the rare vicuñas and wonder why we were doing this. I think Carolina could sense this and I maybe could have caught wink if it weren’t for her ultra dark, polarized mountaineering sunglasses. We started walking, slowly, down a slope of the altiplano. Along the salt lake’s banks life seems impossible, yet a trained eye reveals its abundance. Carolina pointed out falcons passing us by, varieties of plant life, some of the five different flamingo species inhabiting the area feasting on the crustaceans that bring them their rose colored hues. But mainly we hiked in silence, letting the busyness of life quiet, the desert sun warm, and the winds howl offer cadence to our footsteps. After sipping hot corn soup and devouring sandwiches behind a rock outcropping, I began to learn more about our guide who didn’t stand more than five feet tall, had an ancient look, calm temperament and quick smile. Carolina is a true Atacameño, born in a spec of a pueblo at the same air thin height we were at now. Her village sat atop hillsides covered in ancient Incan terraces fed by canals with a once abundant water source. The pre-Incan cultures of the Atacama Desert spoke Kunza, a language that lives on only in plant and place names. She was raised speaking Quechua, a language brought to the land when the Incan Empire spread to its southernmost reaches in northern Chile before the Spanish conquest in the mid 16th century. At birth, her village had a population of a couple hundred people. About 25 are left today. Each family used to shepherd over 200 llamas a piece, each ones’ ears adorned with brilliant wool tassels denoting family ownership. Now her mother keeps about five llamas for their family. And what’s left of the terraces? They’re all still standing, tilted exactly 12 degrees inwards (for the 12 month agricultural and ceremonial calendar of the Incans and to resist seismic activity) as they have been for centuries, except for now only about 5% of the hillsides are farmed. “The problem is water,” Carolina tells me with seemingly no trace of anger. “You see, the copper mines need water to process the metal and they’ve diverted the river farther up towards the source.” She describes to me how her sisters’ husbands work for the mines now. She visits her nieces, nephews and siblings often in the town of Calama. We drove past it on our way from the airport to San Pedro. All the houses were identical boxes, one after another. A sort of American suburban concept with dirt roads, drying laundry, and chickens. She told me more about her family. How her grandparents were known as great shamans or spiritual healers. Her anecdote of how they knew they were chosen – by being struck by lightning not once, but twice (if you’re struck only once you die, but the second time you’re struck you’re brought back to life and have then been given the gift) made me laugh and she laughed along with me, understanding it sounded fantastical to me, but not doubting its truth all the same. Her mother had instilled in her a profound reverence for keeping her peoples traditions alive. She told about her mother’s hate for the mines, adding that she also disliked tourism. I was taken a bit aback. Of course the recent influx of travelers in San Pedro de Atacama had changed it for good and for bad, but I hoped she shared my perspective that the positives outweighed the negatives and that, if done the right way, tourism could help save cultures like hers. I asked her if her mother liked her working as a guide. “No, of course not. She wants me to move back to the village. But I wouldn’t be helping there.” I breathed a little sigh of relief. Carolina then described to me a project she’d been working on for a couple of years through the ALMA Observatory, an international astronomical project stationed in the Atacama Desert because of its high altitude and cloudless skies. Her part had nothing to do with science, however. She’d been traveling from village to village recording the stories of elders about the sky. How to them the Milky Way was a glittering river that you crossed when you died. If you were a shepherd, you were buried with your staff, shoes, food, everything you would need for your journey to the other side. And once you got there, llamas were waiting for you to care for – hence a llama constellation exists in their sky. Carolina is already been planning her next project. 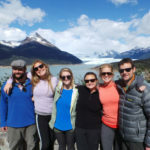 After gaining a bit more experience guiding at the lodges around San Pedro de Atacama, she plans to set up facilities to receive travelers in her pueblo. 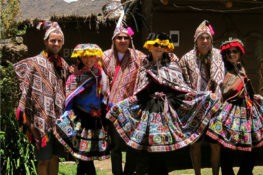 There she will share with travelers her culture and traditions; show them how to shear the wool from a llama, to dye it and to weave it, how to farm the ancient Incan terraces pushing water through the canals, share the ancient beliefs and traditions she believes have great value in today’s world. I was astounded by this girl. She couldn’t have been older than 25 and she was so mature and self-aware, doing something so utterly important. Carolina will shape history. “Knowmad will send you your first travelers,” I promised her. A couple days later, after a couple hours of agonizingly slow trekking (left foot step, breath, breath, right foot step, breath, breath) we reached the top of the Cerro Toco Volcano intact. We let coca leaves flutter to the ground to give thanks to Pachamama, or mother earth. In making my offering and my wishes, I smiled a thanks to Carolina. Hiking along a salt lake at 14,000 ft.
An example of the flora that survives at this altitude. Summiting 18,386 ft Cerro Toco Volcano with views to Bolivia in background.